NICKY CLARK came off the bench to win a game for Rangers at Brechin for the second time this season as they beat City 2-1 at Glebe Park. 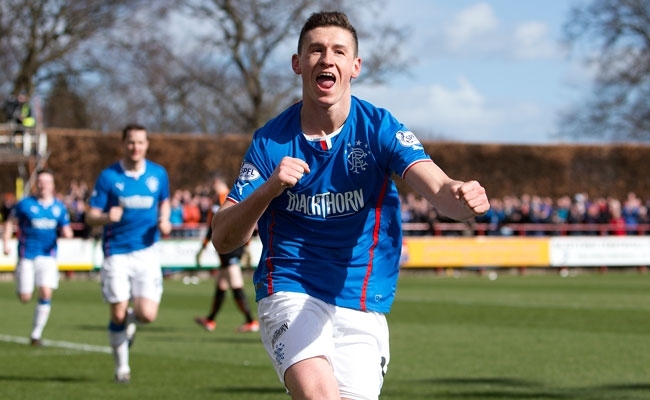 Fraser Aird gave the away side a deserved lead before it fell out of the game a little as the midway point approached. 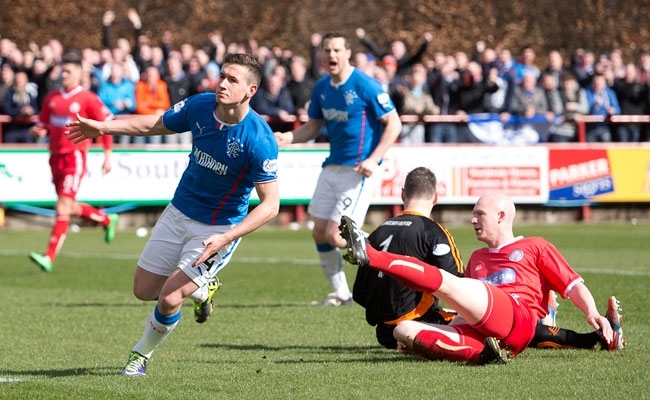 Robert Thomson levelled shortly after the break to end Gers’ run of play without losing an away goal at 1,184 minutes. Clark then came on after Ian Black was carried off on a stretcher with a potentially serious foot injury and within a minute headed his side back ahead. That was enough to swing the fixture in the champions’ favour, just as he did when he struck five minutes from time to clinch a 4-3 victory in Angus in October. Clark’s intervention with his ninth goal of 2013/14 means the Light Blues now lead League One by 32 points following Dunfermline’s defeat to East Fife yesterday. With six games to play in the competition, they remain unbeaten in 38 matches in all competitions in a sequence stretching over seven months. Manager Ally McCoist made just one change to his team from the side which beat Albion Rovers in a Scottish Cup replay last Monday. 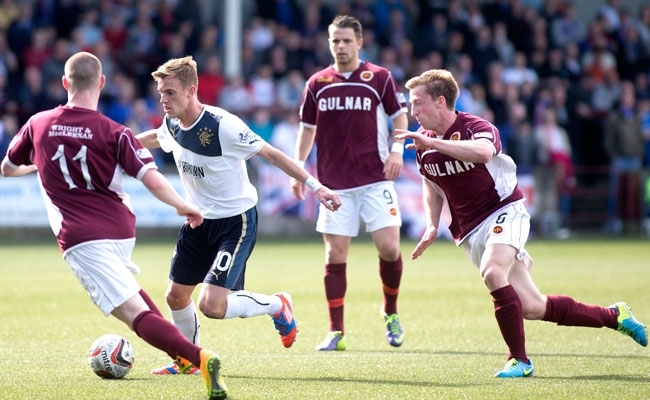 Kyle Hutton dropped out of the pool altogether, with Dean Shiels stepping up to play in behind Jon Daly. There was a relatively pedestrian start from both teams but Rangers should have made more of their first shooting opportunity when it eventually came. Aird did well to salvage Bilel Mohsni’s poor pass out wide and burst away from his man into space 25 yards out. But having scored a terrific goal against last time out, there was to be no repeat of the glory from six days ago on that occasion as he blazed a wild shot high and wide. Nicky Law tried to play in Shiels with no success then failed to latch on to Mohsni’s long ball upfield the way he will have hoped to. Calum Gallagher also hung a teasing ball up in the six-yard box after good industry from Law – who went off injured soon after – only for it to sail slightly too high for Aird to connect. Winger Aird was heavily involved in a lot of Rangers’ early forward play and Shiels set him scampering into the box with an overhead kick but his final touch was too heavy. Keeper Graeme Smith was able to come out and smother that time but he wasn’t so fortunate after 19 minutes as the visitors forged ahead. Full-back Jonny Brown, a scorer against the Light Blues when they last came to Glebe Park in October, intercepted Black’s cross-field pass as it bounced off his back. But he slipped on the awkward surface and that let in Aird, who showed good composure to slot under Smith and give his team a deserved lead. Jon Daly could have had an opportunity to add a second on the break after a Shiels flick released him but he was flagged offside and it seemed harsh. 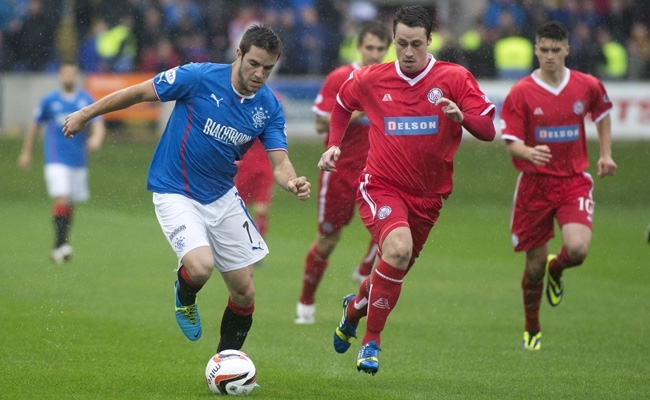 That marked a turning point in the first half, with Brechin applying a decent spell of pressure before the break. Alan Trouten had already had a penalty claim waved away when referee Andrew Dallas had ruled Cammy Bell had got a touch on the ball as he denied him. Before the midway point, Greg Cameron was wasteful with a shot which landed nearer the corner flag than the target. But Darren Petrie’s effort was much better as it required a touch over from Bell to keep it out, while Black and Mohsni both made crucial blocks as triggers were pulled. Those warnings weren’t heeded and four minutes after the restart – more than five months since Rangers last conceded away from home – they were pegged back by City. Thomson was the scorer as he got away from Mohsni to slot under Bell and make it 1-1 following good work by Cameron on the right. 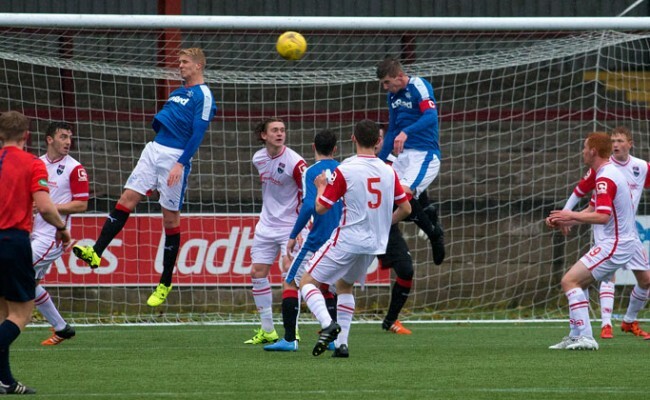 Gers responded quickly by while Daly was able to get a header on target, it was easily held by Smith. At the other end, Mohsni slipped after dithering too long on the ball in the corner but Brechin couldn’t make him pay. Black’s game came to a painful end as he kicked the underside of an opponent’s boot and required treatment before he was carried off. That was Clark’s cue and after some good build-up play he nodded the Ibrox men in front for a second time when he headed in Daly’s cross after a pass from substitute Sebastien Faure. Clark could have had another, Gallagher nearly diverted Lee Wallace’s cross in and Aird only just steered wide with a shot he didn’t actually connect with that well. Lee McCulloch put an Aird free kick a yard too high as well as Rangers finished the game strongest but without adding further to their tally. BRECHIN CITY: Smith; McLean (Cameron 19), McLauchlan, Jackson, Brown (Ferguson 41); Thomson, Petrie, Molloy, Hay, Barr (Carcary 78); Trouten. SUBS NOT USED: Nelson, Walker. 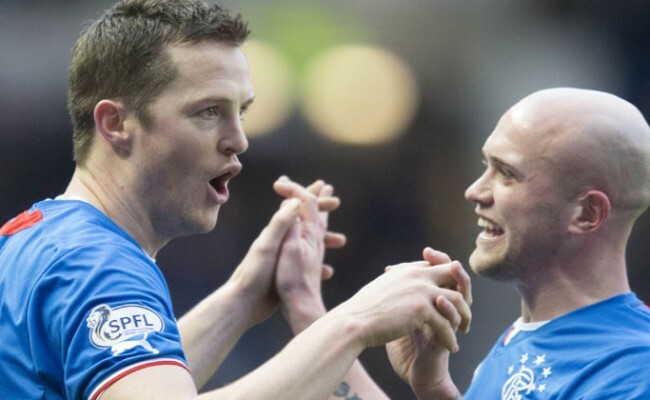 RANGERS: Bell; Foster, McCulloch, Mohsni, Wallace; Gallagher, Black (Clark 65), Law (Faure 25), Aird; Shiels, Daly. SUBS: Simonsen, Crawford, Smith, Peralta, Telfer. SCORERS: Aird 19, Clark 66.